The goblin Fenya sounds calm, despite the flock of violings that swarmed eagerly aroud them - the nasty birds could predict bloodshed, they all knew that. Kvarek felt the sweat on his palms threaten his grip on the spear and shouted over his shoulder; "Magdala, faster!" The witch didn't answer, lost as she was to the sinister harmonies of the rituals, her hands caressing the pillar's grim stone face. A loud rumbling echoed through the ruin, as if some giant creature had awoken and stood up from under layer upon layer of stone and soil. "The witch said that the abominations come out at night, "the goblin muttered. Kvarek's. knuckles whitened as he tightened the grip: "No, only that they are hungriest after dark. They are not afraid of the evening sun, and not of... "He was cut short by Magdala's hoarse voice. "The pillar has answered. I know where the mausoleum is." Then, out of the ruins, the Blight Beast came at the, massive and roaring. Its claws scraped the rocky ground, scouring out deep sores oozing pure corruption, leaving drops of black, mercury-like mildew on moss and stone in its wake. "We cannot escape this," said Fenya. Magdala nodded agreement. "Well then, "Kvarek's sighed, "this were we make our stand, for the right to the treasures of Symbaroum." Symbaroum invites you to join in the adventure! Explore the vast Forest of Davokar in the hunt for treasures, lost wisdoms and fame. Visit the barbarian clans to trade or to plunder their treasuries. Establish a base of power among princes, guilds or rebellious refugees in the capital city of Yndaros. Or survive encounters with Arch Trolls, dark-minded Blight Beasts and undead warlords. But whatever you do, never ignore the warnings spoken by the wardens of the forest: tread carefully and do not disturb the ruins of old, for the dark deep of Davokar is about to awaken. More than 50 pages describing the game world's history geography and cultures, focusing on four particular settings: the Forest of Davokar, the fortune hunter's town of Thistle Hold, the Ambrian capital Yndaros and the cliff of Karvosti where the barbarian clans convene. 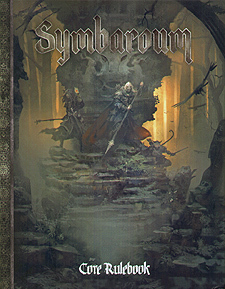 Symbaroum is a complete roleplaying game: all you need to play is paper, pen and a dice set. This roleplaying game is suitable for all adventurous humans, goblins and trolls from the age of 12.